There are two types of Kuman Tong. The 1st type is cruel, wild, ferocious and use for fighting enemies and devious purposes, the other type is to add charm and bring good fortune such as striking Lottery. This Killer "Golden Boy" Spirit is created in a ritual called plug seg, where a devil or phii taai hoong (ghosts who died from unnatural death or evil spirits) , is invited to possess a small human-like figure made of clay, plastic or bone. A Spirit Doctor can then command the spirit inside the statue to attack others. However, this type of Golden Boy is rare and only used by Occult Doctors in the Khmer and Muslim Communities of Thailand. They can be called "Pret Puti Ngan" or "Kuman Pretprab". People use them only to hurt or murder the enemy. In creating this kind of Kuman Tong, the Spirit Doctor will invite phii taai hoong to inhabit in the statue of Kuman Tong. These four types of fierce Kuman Tong have his own ways to destroy the enemy. Kuman Tong Pretsoon has the power to drive people crazy. Kuman Tong Pretkong and Kuman Tong Pretmun are very good in protecting property.They will kill the stranger who invades the house. The only thing that can subdue Kuman Tong Pretmun is Wou Tanoo, which is made of wood used in carrying the dead body. Yet, Kuman Tong Pretkong's power is much stronger than Kuman Tong Pretmun because he is able to conquer Wou Tanoo. The only thing that can stop Kuman Tong Pretkong is the copper Wou Tanoo or Kway Tanoo. Moreover, Kuman Tong Pretkong is able to chase after the enemy every where but Kuman Tong Pretmun can only exercise his power within his sphere. 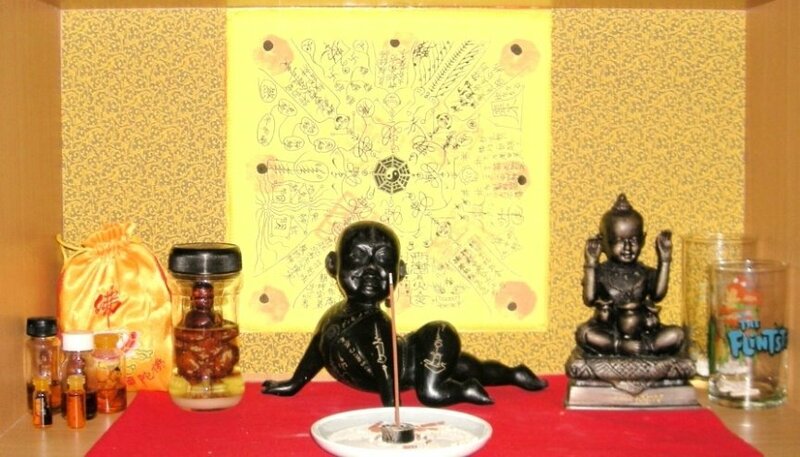 Kuman Tong Pretkong therefore is an outstanding black spirit which can hardly find anything to subdue him. Kuman Tong Pretdub is a cold-blooded killer who can cut the enemy's throat as fast as the professional killer. Kuman Tong the killers are only popular among people who dabble in black magic. Ordinary talisman collectors do not dabble in these. As with the 1st type, these kinder Golden Boys also need a plug seg ritual to come alive. Spirit Doctors may use their mind power to invite high level spirit to dwell in the figure. Or they use withered wood from certain trees that already contain spirits to carve the boy. This Fortune-Bringing Kuman Tong does not have any particular name. We can see the statues of Kuman Tong placed in many stores in Thailand and South East Asia because the shopkeepers believe Fortune-Bringing Kuman Tong will increase the customers coming to their stores and also bring good fortunes, wealth and prosperity to the owners. Generally, the owner of Kuman Tong will name his talisman such as Udomdat, Udomlap, and Udomchoke. In Singapore or Malaysia , usually the Kumantong owners will name them as " Zai Zai", like a pet name of no particular meaning. The Monks and Spiritual Doctors merely create these good Kuman Tong to encourage merchants to do good deed and want something to hold to. Therefore this kind of Kuman Tong is the most famous talisman in these days.